There are certain dorm essentials you want to make sure you have in your college supplies. One of these must have dorm items are shower sandals. You don't want to stand in the dorm shower and you definitely don't want to walk through the bathroom without our Showaflops - Men's Antimicrobial Shower Sandal in Blue/Lime on your feet. These dorm essentials have a cool blue and lime color but most importantly, they're going to keep your feet off of the dorm bathroom and shower floors. 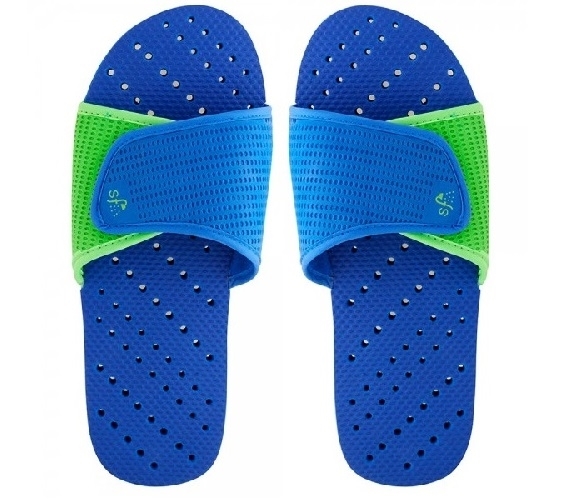 Our Showaflops - Men's Antimicrobial Shower Sandal in Blue/Lime have drainage holes so soap and water don't get trapped in your shower sandals. On the bottom of these dorm essentials are deep diamond grooves to help prevent slipping and sliding on the dorm bathroom and shower floors. Not only that, but your feet will also be able to stay inside of your shower sandal a little easier because of the textured pebble surface under your feet. These dorm necessities are perfect for the college dorm bathroom, but they don't have to be limited to there. Take them to the beach, gym, and even the college pool with you!